Early on the morning of December 26, 2016, Carolin Harris, 74, owner of Harris’ Steakhouse (informally called “The Mothman Diner” on Main Street) passed away. 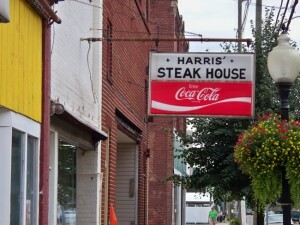 Harris was a well-known Point Pleasant, West Virginia, personality. Many tourists stopped in to her diner to talk to her and look at her collection of items. 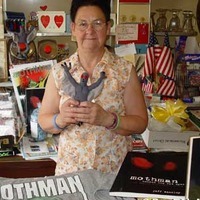 She also was a supporter of the Mothman Festival. 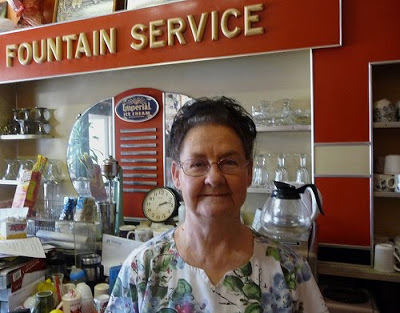 It is with great sadness that we even have to say this, but late last night we lost a wonderful person, the sweet and lovable Carolin Harris, of Harris Steak House (or as you might know it by – “The Mothman Diner”). She was also the co-director of the Mothman Festival and has and has been with us through our journey from the very beginning. She was like a mother to so many in our small town…always welcoming to all, with her kind and hospitable heart and a smile on her face. We’re not sure that we’ll ever be able to fill this void of not having her around. She will be greatly missed, that’s for sure. 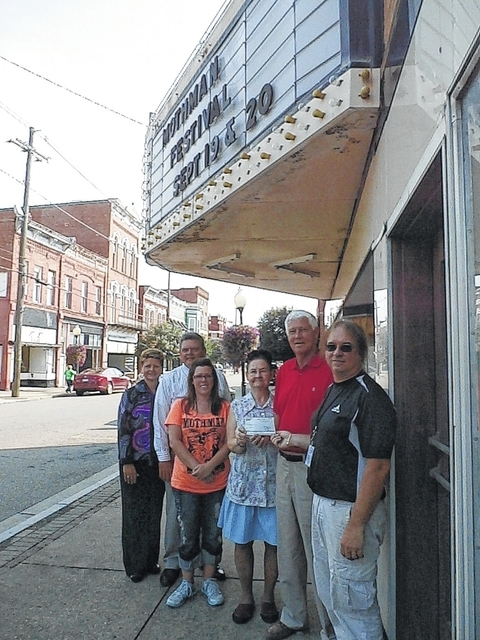 Point Pleasant Daily Register photo of the Mason County Commission making a contribution to the 2015 Mothman Festival in the amount of $750. Pictured accepting the check from Commission President Rick Handley are Jeff Wamsley and Carolin Harris of the Mothman Festival. Also pictured, Ashley Wamsley-Watts, County Clerk Diana Cromley and County Administrator John Gerlach. Harris’s father, 85, died in 2007, right before Carolin Harris’s niece died in a head-on car crash. Harris was always friendly and generous with her time. I visited her several times in 2001 and 2002, just before the movie Mothman Prophecies began to bring fame to the community. Carolin Jean (Sayre) Harris, 74, of Point Pleasant, passed away Monday, December 26, 2016, at Pleasant Valley Hospital. 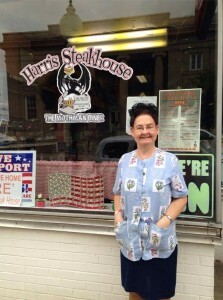 She was the owner/operator of Harris Steak House and served on the Board of Directors for Main Street Point Pleasant. Carolin was involved in Mason County Tourism and was a staple within our community. She truly earned the title, “Miss Main Street.” She was such a giving person, going out of her way to meet the needs of others, while wanting nothing for herself. She was born November 27, 1942, in Mason County, a daughter of the late Omen and Alberta (Absten) Sayre. In addition to her parents, she was also preceded in death by her husband, Thomas Gene Harris; and two sons, Timmy and Toddy Meadows. Carolin is survived by her step-son and daughter-in-law, David and Vicki Harris, of Poca; her “grandkids”, David Harris and Chad Harris and their children; brother, Charlie “Eddie” Sayre, of Point Pleasant; sister, Marcella DeWeese, of Point Pleasant; three half-sisters and brother’s-in-law, Cindy Haught, Sandra and Dr. David Roddy and Judy and George Oliver; and many nieces nephews and friends of our community who will miss her. Carolin’s life will be remembered at 11:00 a.m., Thursday, December 29, 2016, at the Crow-Hussell Funeral Home, with Pastor John Holland officiating. Burial will follow in Buffalo Memorial Park, in Buffalo, WV. Visitation will be held at the funeral home on Wednesday, December 28, 2016, from 6:00 p.m. until 8:00 p.m.